If any of you have seen several of the documentaries on the Duggar family from Arkansas who have sixteen children, you probably won't be surprised to learn that they've just had Baby No. 17. And she wants more. I've watched these documentaries about them over the past few years and have seen them grow from fourteen to seventeen kids. Since there are two sets of twins, mom has only had to go through fifteen pregnancies. The oldest child is 19 and Mom has just turned forty. The pic here is when they only had fourteen kids. The kids all seem to be well-adjusted and well-cared for. Mom and Dad are both real estate agents, they receive no public assistance and they've always lived debt-free. (That's really admirible). Each of the older children is assigned a "buddy", that is, one of the younger children to care for. That sounds like a pretty clever idea and certainly teaches the kids responsibility. If you look at the websites about the Duggars and read the comments, most of the comments are pretty critical of them for having so many kids. Some comments are even pretty cruel and I hope their kids aren't being exposed to this. My initial reaction is one of criticism as well, but I really admire the fact that they've never incurred any debt, even when they built a new 7,000 sq. ft. house on twenty acres of land. And besides, compared to the screwed-up, dysfunctional families that exist these days, one can hardly be critical of the Duggars in comparison. I really wonder what kind of adults these kids are going to be. How prepared will they be if they move away and live in the "real world?" As far as I can tell, they've lived their whole lives having very little contact with anyone who has values different from their own, almost like a cult. I think the oldest kid who is 19 is remaining at home and studying law through an internet-based course of study. 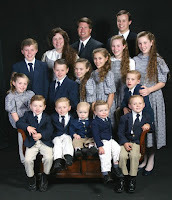 I doubt that the kids will leave the Duggar compound. My guess is that they'll just build homesteads on the twenty acres and raise families of their own there. What would really be interesting to see, is a documentary about them in ten or twenty years when they're all adults and no longer cute little kidlets. I'll set up my Tivo to catch the program. I saw the show about them building their house. They kind of creep me out. They seem nice enough and all but yeah, "cult" sounds like the right word. Lorraine and I talked about this the other day over wine on the Deck of Delight - the insular nature of many communities and the families they are raising. We noted that the families in our own neighborhood who are Orthodox Jews seem to exclusively socialize with one another. Also Mormons fit this mold more often than not. I agree with you about wondering what will happen to such children when they have to function in the "real" world. I only hope they are prepared for the challenges it holds.